The annual Researching New York Conference has been set for November 21-23, 2019, at the University at Albany. 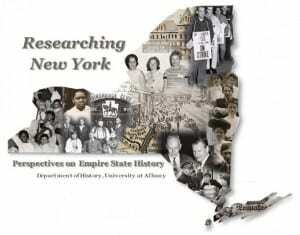 Organizers are seeking individual and panel proposals on all aspects of New York State history, in all time periods. Roundtables, media presentations, workshops, and other non-traditional presentations are encouraged. The conference meets annually in November, bringing together historians, archivists, public historians, graduate students, museum curators, teachers, documentarians, and more to share their work on New York State history topics. The conference is sponsored by the University at Albany Department of History & History Graduate Student Association, University at Albany M.E. Grenander Special Collections & Archives, and the New York State Archives Partnership Trust with additional support from New York State Museum, Humanities NY, and the University at Albany College of Arts & Sciences, Office for Research, and University Auxiliary Services. Additional support for featured public events comes from the New York State Writers Institute. Proposals are due June 16, 2019 to resrchny@albany.edu. For further information email resrchny@albany.edu.